Sky sports directors: Who’s in the frame? The departure of sports directors Sean Yates and Steven de Jongh in the past month has left Team Sky with a tricky management conundrum. The pair played a vital role; Yates was behind the wheel during the team’s victorious Tour de France while de Jongh took charge of the team’s Classics campaign. Sky’s zero-tolerance approach to doping could cause a headache when it comes to finding replacements. Cycling Weekly takes a look at some of the possible candidates to fill the gaps in the line-up. Boardman perhaps lacks the experience behind the wheel of the team car but he would be a perfect fit when it comes to Sky’s highly technical approach to training and racing. He has also shown himself to be a fine spokesman for the sport. He is busily involved with his media commitments and the bike company that bears his name. A former pro, the current Rapha-Condor boss managed the Great Britain road team between 1998 and 2005, resigning after the 2005 World Championships. His experience working with Brailsford and the British system makes him a strong candidate. Herety is still busy working on his team’s project to develop younger riders and it would take a lot for him to leave the men in pink and black. One of Sky’s current coaches, Ellingworth has a strong relationship with many of the Sky riders from his time on the team and running the Academy, nurturing the likes of Geraint Thomas and Pete Kennaugh. Ellingworth has expressed no interest in stepping into the role of DS and prefers to remain as a coach. Olympic silver medallist Hayles will be familiar to many of the riders from his outings with the Great Britain track team. He rode on the Continent for two seasons on the road with Cofidis and is currently Mark Cavendish’s assistant. Along with Dan Lloyd, CW understands Sky has already spoken to about Hayles a job – which they both turned down. He will remain PA to Cavendish next year, along with his various media commitments. Lloyd has experience racing all over the world and, although he’s completed three Grand Tours, it’s his Classics experience that would be well sought after at Sky. The long drives and extended stays away from home might not suit Lloyd, who has a young family and is building a career in commentating. Has signed up to DS for IG-Sigma Sport for 2013. He’s one of the most experienced of the UK’s Classics riders and will already know many of the riders and staff at Sky from his days racing in a GB jersey. He directed IG-Sigma at this year’s Tour of Britain and would be one of the top candidates to replace Steven de Jongh. 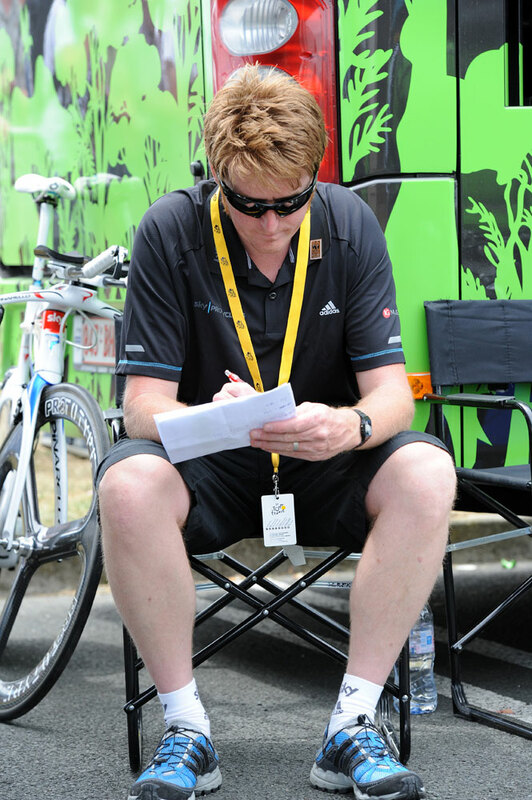 Hammond is contracted to manage the Madison-Genesis team in 2013. Former national champion Stephens rode the Olympic Games and Giro d’Italia before joining Sigma Sport in 2001. He has plenty of riding experience but has spent a limited time behind the wheel, having left Sigma at the beginning of the year. Stephens has taken on a number of media roles of late, including being part of the ITV4 presenting team for British races. Moving back into the team car might not be his cup of tea. He has experience of Grand Tours, riding the Tour and winning stages and the points jersey in the Vuelta. Following a return to the domestic scene in 2003, he has spent the last two years behind the wheel at the Node4 team. It’s been 15 years since he was part of the professional ranks in Europe. Wegelius had a long career as a domestique before taking a DS role at Garmin at the end of 2011. He was a vital part of the team behind Ryder Hesjedal’s victorious Giro campaign. Garmin’s anti-doping stance is the polar opposite of Sky’s, but perhaps more importantly Wegelius was one of the riders to sever his ties with the Great Britain set-up after the 2005 Worlds. A move to Sky seems unlikely. The original version of this article appeared in the November 22 2012 issue of Cycling Weekly magazine.